The March 2016 issue of Safari magazine ( Gujarati Edition) is published quite on time. Being a fan of this knowledge and science oriented magazine, we were awaiting eagerly for it. So we bought it immediately and went through it thoroughly and here are our views and reviews for the same. 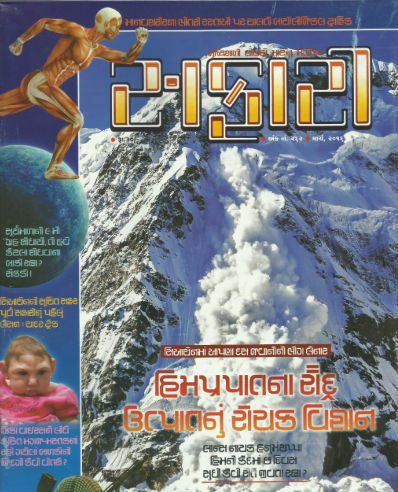 The cover page of this issue very effectively embeds a photograph of an avalanche along with some other small photographs and illustrations. We would love to repeat the fact that we consider the editorial as one of the most important part of any media (be it a magazine or newspaper). It is like a bridge between the reader and the editor. It is kind of one-to-one-connect for both them. We see the vision of the editor behind the specific issue and his/her take on latest happenings. Harshal Pushkarna, the editor of this magazine, talks about the importance of border outpost at Siachen (सियाचिन) for India. Lance Naik Hanumanthappa is one of the brave Indian soldiers whom we lost in this mishap. This avalanche ignited a debate where many political fellows found expressing their views that India should rather close those border outposts in Siachen. As we have lost around 900 soldiers due to the extreme weather situations there, there is no point in keeping those outposts and risking lives of many other soldiers in the future! National security is however not that easy topic to discuss. The editor here clearly shows his views. When you read the magazine don’t miss this section. The last cover page initiates the detailed answer for the Super Question of the issue, which is also about this Avalanche mishap. The answer explores almost every major aspect of an Avalanche including What happened during recent avalanche mishap at Siachen? How Lans Naik Hanumanthappa remain alive for five days due to air pocket despite of buried under snow? The back cover page of this issue talks about the history behind this buggy and how the related stuff is maintained at the “Rashtrapati Bhavan in India”. A short and effective piece of writing with embedded photographs”. If you are interested in Astronomy, there is an article by Digambar Vyas, which you will find interesting. It is considered that we have 9 planet in our solar system. Then in 2005 it was decided to not to include “Pluto” in the same, making the count to 8. Now as one more planet is discovered, the figure again became 9! So how many more planets are there in our solar system which are not discovered yet? Well, the article has the analysis. The article even talks about some interesting stuff that, why if any American scientist couldn’t have named “Pluto” as “Pluto”! There are many more facts you can find in the article. Another article by the same author is about biology. He talks about how the biological traffic in human body runs so effectively and smoothly. To make the article interesting he talks about traffic jams in the initial segment. The article proves that why human body is a perfect system. It also tries answering the following questions (in terms of human body). What is speed of thoughts? What is the speed of messages sent through the nervous system? What is the speed of blood circulation>? What is the speed of air we intake through breathing? At what speed the food moves ahead in digestive system? At what speed the urine passes out? How the biological traffic behaves when we are in relaxed mode? Nagendra Vijay comes up with an article about the ISIS. There is so much written about this organization, but there are very few article you may find which talks about the background events which took place before almost a century, which created the circumstances which are resulted into such organization. The article is very detailed and worth reading. The article talks about many aspects and historical events and figures including the references of Mahatma Gandhi, Lawrence of Arabia, Mustafa Kemal Atatürk and many others. As soon as we think that now human kind have found a solution or a way to prevention of a specific decease, the other dangerous one introduces itself! Be it the act of balancing by the nature or whatever, such things happen. Zika Virus is the new challenge for us. To know more about Zika virus, you can read this Wikipedia Article. This is official page of WHO, talking about Zika virus. There is an article focused on Zika Virus by B. M. Purohit in this issue. The article however talks something less explored (or known). It tries to analyse the possible future lives of the children who are victim of Zika Virus. It explores “microcephaly” or the “abnormal smallness of head” and it’s impact on mind and brain. It is definitely a worth read article. If you are adventure lover or love to read travelogues, the article by Harshal Pushkarna is for you. (If not, then also you will love reading about his experiences of travelling in Ladakh for sure). Zanskar is a river in Ladakh (https://en.wikipedia.org/wiki/Zanskar_River), which freezes during winter (The temperature between -20oC to -30oC is considered as normal here, it even goes between -50oC to -60oC at times!). Do you know that during August-September every year, the Indian Army arranges a special travel for around 40 civilians to Siachen and nearest places? If you pass the medical tests by army, it even provides you training and needed material like Snow-shoes, gloves, goggles and other stuff. Rather than spilling more beans about this article, I would like to summarize that, it is definitely a must read. The author’s responsible behavior of not publishing any photograph which can reveal sensitive information about geography of the place, is something you must appreciate. Name the species which possess the strangest attributes according to the scientists. What is the average speed of International Space Station? Can we see it travelling during the night? What is the importance of TAPI gas pipeline? Provide details about the petition filed by Pet Lovers Association in Supreme Court Of India against the decision of Gujarat HighCourt citing “birds cannot be caged, as flying free is their basic right” (not word to word translation, just the center thought). What is the weight of a human head? Does Homa Bird actually exist (Reference 1, Reference 2)? What is the meaning of “Transfer Orbit” (in reference of satellites like INSAT)? What is the exact year when India came under British rule? According to us, it is definitely a “value for money” issue. It gives you best for not only the money, but also for the time you spend to read it. It is hard to find such nice reading material at such low cost. The only thing in its against is, it is available in a regional language only, making it’s reach limited.